Waterfowl have been scarce across Western North Carolina this fall and winter. Traditional haunts like Lake Julian in Asheville, Lake James near Marion and our own waterfowl magnet Lake Junaluska have been mostly vacant this season. Even coot numbers are really low this year. But you can’t give up on Lake Junaluska, all it takes is one front and things mysteriously fall from the sky. I was by there one day last week and saw my first tree swallows of the spring. I called Bob Olthoff and, of course, he had already seen them. Then he told me that he had also seen a male common merganser in the last day or so. Common mergansers are anything but common on Lake J. They are seen occasionally, more often in fall when they are not in breeding plumage. In the fall, males, females and immatures are all more or less gray with a rusty/brownish head. In this plumage they can sometimes be confused with the, more common, red-breasted merganser. But this time of year there’s no mixing up the two males. Male or drake red-breasted mergansers have – wait for it – red breasts! Actually, the breast is more of a deep chestnut color; the flanks are gray and the back is dark but shows a white wing patch between the gray flanks and top of the back. The glossy green/black head generally shows a shaggy crest. The drake common merganser also has an iridescent green/blackish head sans the crest. The bill is deeper and redder than the red-breasted and the throat, chest and flanks are all solid white. The back is black. The common merganser is a large duck – mallard size. It is a diving duck and like all mergansers has a serrated bill that makes catching and holding fish easier. Fish make up the bulk of the common merganser’s diet but they also prey on mollusks, crustaceans, insects and amphibians. They breed in the northern most reaches of North America from interior Alaska to Newfoundland south to New England, the Great Lakes, Minnesota and Michigan East of the Rockies and in the forests of Washington State, Oregon, California, down to Arizona, New Mexico and even Chihuahua. They are late migrants in the fall and early migrants in the spring. Many are facultative migrants moving only far enough south to find open water. Birds along the east and/or west coast tend to migrate farther distances than interior birds. Common mergansers are primarily cavity nesters but in mountainous terrain they will nest on ledges and in rock crevices. They can also be enticed to use nest boxes. The day after I spoke with Bob I (mysteriously?) found myself circling Junaluska again. It was a chilly morning and the bridge was closed. I stopped up at the cross and got out and glassed the lake. In the middle of the widest part of the lake I saw two white objects. 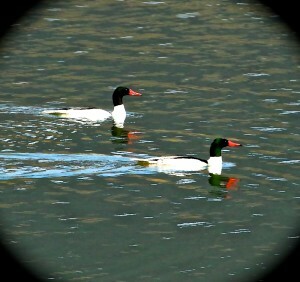 Even at that distance, with binoculars it was easy to tell they were common mergansers. I drove around the lake and joined Bob. A couple of birders from Atlanta, who have a place in Maggie Valley –Robert and Stacy Johnson –, stopped by. 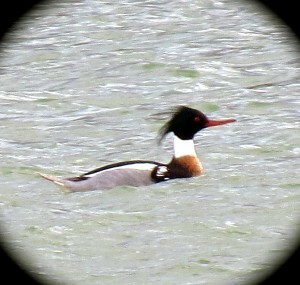 As we chatted, the mergansers began drifting our way. They just kept getting closer and I’m thinking “Murphy’s Law” because today is the day I don’t have my camera. The big beautiful birds cruised to within a few hundred feet of us and thankfully not all birders are as ill prepared as I. Robert had his camera and was able to snap this shot, which he graciously shared.